If it is a cool season type grass (fescue, bluegrass and ryegrass types) then your removal is easy. You can quit watering and cover it with 6” of mulch after mowing it to the ground. Or you can mow it to the ground and dump 3” of compost on it and then turn it over, using a spading fork or a rototiller. If you have ANY bermuda grass or St. Augustine this won’t work. You will have to work on those areas in one of the following ways. 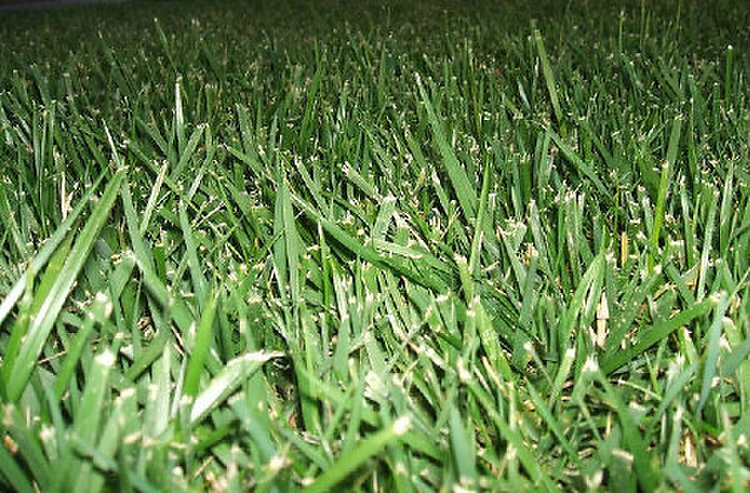 The best bet for removing a bermuda grass or St. Augustine lawn is available to you right now. It is called Solarization and it works beautifully, though your neighbors may wonder what you are doing. You mow or weed whip the grass as low as possible to the ground. Then turn on the sprinklers until the water soaks about 2 feet deep into the soil. This is important. The only time I have seen this project fail is when there was inadequate watering. Then you cover the entire area with heavy CLEAR plastic. Don’t believe the sites and people who tell you to use black plastic. If you use black plastic, when you peel it back the bermuda grass will be right there laughing at you! Also this plastic has to be heavy, like visqueen – ­­not like dry cleaner bags. With the clear plastic in place covering every inch of the wet soil, you weight down the edges with dirt, rocks, wood, or whatever you want. The point is to seal the plastic against the ground. Before you even finish covering the edges you will see the soil start to sweat and condensation will form on the plastic. You need to get this project going immediately since it needs 6 to 8 weeks of HOT weather to make this work. Will it hurt my trees and bushes? No. Will it hurt the beneficial microorganisms in the soil or the earth worms? No. Will it change hard soil into soft soil? Are you kidding? Of course not. But it will help somewhat. Then next fall, after the heat lets up and you are ready to plant your new landscape, you can peel off the plastic. Your soil will be beautifully free of weeds and grasses. The other alternative for lawn killing is to use glyphosate (RoundUp or similar herbicide). Many people choose not to use this for health and environmental reasons. If you are in a big hurry and you choose to use it then I would urge you to apply it 3 separate times since it never gets a complete kill in one application. And as for that application, please don’t spray! Use a paint roller on a handle so you won’t end up breathing in as much of it. You will need to get the grass green and healthy again before each application. This will take about 6 weeks total so you might as well solarize instead. It’s cheaper and much better for the soil (and you). WHY is it so important to kill the bermuda grass and St. Augustine before installing your new landscape? If you don’t kill these grasses then they will come creeping back and ruining the appearance of your new landscape and crowding out your new plants. Those people who have let their lawns “die” this summer by not watering will have a big surprise this winter. After even just one rain the grasses will come back. Why can’t I just rototill the bermuda grass and St. Augustine to get rid of it? Because that doesn’t get rid of it, it just replants it! Why can’t I just dig out the top 6 to 12 inches of soil to get rid of it? Because those grasses can grow their roots (actually rhizomes) 2 feet deep. Why can’t I just bury it under 6” of mulch and wait? You will be waiting for the grasses to grow right up through the mulch, which they will do. Good luck on your project. By this fall you will be ready to tackle the design and installation of your new­­ and more appropriate­­ landscape. Connie Beck has a long history of teaching organic gardening and landscape design in the San Diego area. This is the best article I’ve read for removal of grass-clear and specific instructions to help the home gardener be successful. The method is a keeper; you might want to file it away for reference. Although the solarization takes a while and it’s a lot more work the results are worth it if only to reduce the use of toxic chemicals.